April 6th is National 406 Day. It is easy to remember, as the date (04/06) corresponds to the 406 MHz frequency used by these devices to transmit digital signals to satellites. These beacons are considered by many in the maritime trades to be the best life insurance available. And in some cases, they are legally required by vessel owners. To read more about safety gear, please see our page regarding life rafts, EPIRBs and survival suits. National 406 Day is also a reminder to anyone with a beacon that federal law requires registration to be current. What exactly is an EPIRB? It is an Emergency Position Indicating Radio Beacon that works by transmitting a signal via satellite that can then be relayed to a rescue coordination center. The device can be automatically activated (for example if the device is under more than 3 meters of water) or manually activated to transmit a distress signal. All 406 MHz EPIRBs must be registered with NOAA. Registration is free and can be done on at www.beaconregistration.noaa.gov. You may also mail your registration to NOAA. Beacon registration must be updated at least every two years or sooner if vital emergency contact information changes. This information is only made available to authorized search and rescue personnel when and if it is needed. Beacon owners should not allow inexperienced workers to handle EPIRBs to avoid damage and false alerts. Any crewmember who will be handling an EPIRB should be properly trained and be familiar with the manufacturers’ documentation. Testing an EPIRB should be done according to the manufacturer’s instructions to make sure the device is functioning properly and to avoid a false alert. Mounting brackets or housing units should be examined frequently for damage. If a device has any corrosion, cracks, or water damage, the unit should be replaced immediately. When disposing of a beacon, make sure the battery is disconnected or removed to prevent a false alert. The unit should also be unregistered via www.beaconregistration.noaa.gov. If you transfer an EPIRB to another party, make certain that the new owner understands the importance of re-registering the device with their own contact information. You are responsible to remove your information from the database. If your EPIRB is accidentally activated, NOAA asks that you call the U.S. Air Force Rescue Coordination Center at 1-800-851-3051. If you cannot make contact, use any means necessary to inform authorities that a false alert has been transmitted and should be canceled. 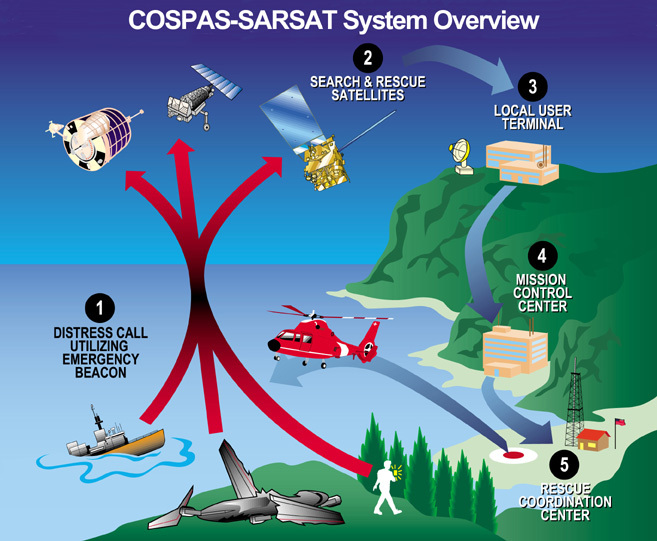 The International Cospas-Sarsat Program (Search and Rescue Satellite Aided Tracking) became operational in the 1980’s. The program was originally initiated by Canada, the United States, France, and the former Soviet Union in 1979. Over 44 nations are involved in tracking and detection, and information can be forwarded to over 200 countries and territories nationwide. Satellite distress beacons have saved over 22,000 people worldwide since the first distress call was answered in 1982. If you haven’t registered your EPIRB, please do so today. Your life might depend on it.